Super Mario; Super Mario Land; Paper Mario; Mario & Luigi; Mario vs. Donkey Kong; Dr. Mario; Super Mario Advance; Mario Party; Mario Kart; Mario Golf; Mario Tennis; Mario Strikers; Mario Baseball; Mario Artist; Mario's Early Years! The Mario franchise is a media franchise consisting of video games published and produced by the Japanese company Nintendo. The title character is a fictional Italian plumber who serves as the hero of a realm called the Mushroom Kingdom. The franchise was created by game designer Shigeru Miyamoto and its first installment was the arcade game Donkey Kong, released on July 9, 1981. The games are primarily developed and self-published by Nintendo internally, with some games in the franchise being developed by other companies under Nintendo's supervision, such as Hudson Soft, Camelot Software Planning, Intelligent Systems, and AlphaDream. Most Mario games have been released for Nintendo's various video game consoles and handhelds, from the third generation onwards. The main series in the franchise is the Super Mario series, consisting of platform games that typically involve Mario and his brother Luigi working to save the Mushroom Kingdom and its ruler, Princess Peach, from the villainous Bowser and his Koopa Troop. 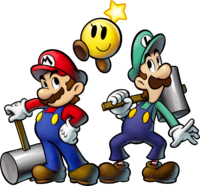 The two brothers use their trademark jumping ability to help them progress through levels, while also making use of power-ups of various kinds. Mario games of other genres include the Mario Kart racing series, sports games such as Mario Tennis and Mario Golf, role-playing games such as the Paper Mario and Mario & Luigi series, and several educational games. In total, over 200 video games are included in the franchise, which combined have sold over 500 million copies. The franchise has also been licensed into other media, such as television series, comics, children's books, and a critically lampooned feature film. Mario has become the flagship franchise of Nintendo, gained massive critical acclaim and recognition throughout the world, and is the best-selling video game franchise of all time. 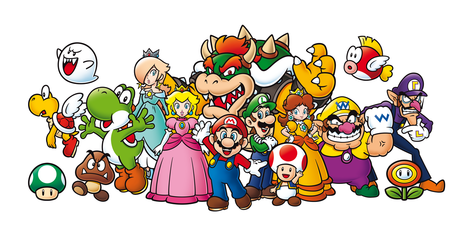 A promotional poster showing elements of the Mario franchise's fictional setting of the Mushroom Kingdom, and several of its major characters including, from left to right: Goomba, Koopa Paratroopa, Wario, Princess Daisy, Donkey Kong, Toad, Princess Peach, Bowser, Mario, Luigi, Yoshi, Rosalina, Boo, Waluigi, Koopa Troopa, and Piranha Plant. The franchise revolves around the adventures of an extensive cast of recurring characters. The main protagonist of the franchise, the titular Mario, is a fictional Italian-American who formerly worked as a plumber but now serves as the hero of a realm called the Mushroom Kingdom, which he endeavors to defend by traversing his way through stages filled with obstacles and enemies. His arch-nemesis is Bowser, the king of the Koopas, a race of evil-driven anthropomorphic turtles. Bowser is responsible for most, if not all, of the Mushroom Kingdom's invasions, and almost always appears as the final boss, who constantly and consistently attempts to put an end to Mario and his friends. Mario's younger but taller fraternal twin brother, Luigi, often participates in his adventures alongside him; in early games, he was only playable in the two-player mode. The Mushroom Kingdom's ruler, Princess Peach, is Mario's love interest and recurring damsel in distress; she repeatedly falls victim to Bowser's kidnappings and has to be rescued by Mario, but occasionally serves as a protagonist herself. Her kingdom's inhabitants and her personal servants are the Toads, a species of fungal creatures who often support Mario during his adventures; a homonymous individualized member of this species often appears as a sidekick to Mario and Luigi and sometimes serves as a damsel in distress, and in spin-offs he is given a female partner named Toadette. Another prominent sidekick of Mario's is Yoshi, a dinosaur-like creature who serves as a riding mount to Mario, and has a long tongue which he uses to eat food and enemies; this character became so popular after his debut that he was spun off into his own franchise. Mario also has a greedy, hot-tempered doppelganger rival named Wario, who has antagonized Mario on various occasions, and also serves as an anti-hero with his own adventures which generally involve money grubbing and treasure hunting. Donkey Kong, a muscular and somewhat dim-witted ape, originally served as Mario's first rival in his arcade debut, but eventually became the main protagonist of his own franchise alongside his monkey sidekick Diddy Kong. Other significant recurring characters in the franchise include Princess Daisy, the tomboyish ruler of a four-kingdom country called Sarasaland; Birdo, a pink dinosaur creature originally portrayed as an antagonist but revived as Yoshi's frequent ally in spin-offs; Waluigi, Wario's partner in crime; Professor Elvin Gadd, an aging scientist and inventor; Rosalina, a mysterious figure who watches over the cosmos; the Lumas, a species of stars who are cared for by Rosalina and often accompany her in multiple games; and Pauline, originally portrayed as the damsel in distress in the arcade Donkey Kong but eventually resurrected as a city mayor and singer. Additionally, Mario and Luigi have their own infant versions, who are recurring characters in Yoshi's adventures and appear alongside their adult counterparts in spin-offs. 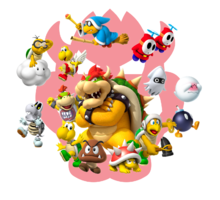 All of Mario's recurring enemies are assembled into Bowser's "Koopa Troop". Throughout his adventures, Mario faces a wide variety of enemies that make attempts to hinder his progress. Two of Mario's most common enemies are the Goomba and the Koopa Troopa. The Goombas are mushroom-like creatures that betrayed the Mushroom Kingdom, and are often the first enemy that Mario encounters on his adventures; typically they are extremely weak to the extent that a single stomp is enough to defeat them. Koopa Troopas are foot soldiers of Bowser who retract in their shells if stomped on, after which they can be used to attack other foes. They come in multiple colors, most often green and red; green Koopa Troopas move around recklessly and tend to fall off platforms, while red ones are much more cautious. Koopa Troopas also exist in several variants, the most common being the aerial Koopa Paratroopas, which have wings on their shells that Mario can detach with a single stomp; and the skeletal, undead Dry Bones, which are typically found in fortresses. There are also many other types of Koopas, including the projectile-wielding Hammer Bros., the hard-shelled Buzzy Beetles, the cloud-riding Lakitus and the Spinies they drop, the projectile-throwing Spikes, and the sorcerous Magikoopas. Other common, recurring enemies that Mario has faced over the years include the Boos, timid ghosts that cover their faces whenever the hero stares at them; Piranha Plants, man-eating flora that dwell within pipes; Pokeys, spiked cacti with detachable body segments; Monty Moles, mole creatures that burst out from the ground; Wigglers, caterpillars with segmented bodies and large noses which when stomped on get angry and run frantically; Shy Guys, masked creatures wearing robes who come in many different variations; Bullet Bills, projectiles that are shot out of cannons called "blasters"; Bob-ombs, anthropomorphic wind-up bombs with short tempers leading to inevitable explosions; Chain Chomps, tethered ball-and-chain creatures that lunge at Mario when in close proximity; Bloopers, squids that like to corner and close in on their prey; Cheep Cheeps, fish with wing-like fins and the ability to attack above the surface of the water; Thwomps, rectangular rock creatures that flatten whoever passes below them using their own weight; Whomps, stone slab creatures with bandaged backs that flatten the player with their faces; and Lava Bubbles (also known as "Podoboos"), living fireballs that inhabit lava pits and attack by leaping upward out of the lava. Major individualized minions of Bowser include his son Bowser Jr.; a seven-member clan called the Koopalings; Kamek, a high-ranking Magikoopa who often serves as one of Bowser's top acolytes; and Boom Boom, a powerhouse that attacks by flailing his arms. An alternative group illustration of the major characters in a hand-drawn art style. The franchise is known for its colorful, cartoon-type and quirky atmosphere. Aesthetically and tonally, Mario's world is colorful, cartoonish, quirky and full of personality. The Mario series is very flexible in terms of plot, with gameplay almost always emphasized over story; nonetheless, the games' plots can range from simple stories meant as a vehicle for the gameplay (as with many of the 2D platformers), to deeper, more intricate plots that introduce complex characters and lore (as with many of the RPG titles). While the overall direction of the games can vary from lighthearted romps to epic, sprawling adventures, they are always optimistic and family-friendly in nature. As Nintendo's flagship franchise, Mario is designed with universal appeal in mind; although its colorful characters and settings are highly appealing to children, Miyamoto and others at Nintendo have repeatedly stressed that Mario and his games are designed to be "cool" and to be played and enjoyed by all ages. As such, the games often feature simple core gameplay, while featuring bonus levels and modes meant to appeal to more seasoned gamers. The central location of the Mario universe is the Mushroom Kingdom, which Peach rules over and Bowser regularly invades. The kingdom has a diverse landscape that includes forests, deserts, snowlands, beaches, mountains, and plains. When Bowser invades the kingdom and kidnaps Peach, he takes her to his castle, usually situated in a volcanic world, and Mario and his friends have to travel there and defeat some of Bowser's most powerful minions, as well as Bowser himself, in order to get the princess back. Some games have been set in locations other than the Mushroom Kingdom, such as the island where Yoshi and his dinosaur friends live, and Isle Delfino, a large dolphin-shaped tropical resort. The Super Mushroom, one of the most iconic Mario franchise items, was ranked first on UGO Networks' list of the 11 greatest video game power-ups of all time. The site's reviewers called it "quintessential." In the main Super Mario series, Mario traverses his way through the games' various levels by defeating enemies, collecting coins, and solving puzzles. Since his earliest games, Mario has been defined by his trademark jumping ability, which he commonly uses to help him progress through the playfield and defeat the majority of his enemies. This ability has seen numerous evolutions throughout the series, including the Spin Jump from Super Mario World; and the Triple Jump, Wall Kick, and Long Jump, all introduced in Super Mario 64. In the 2D platformers, Mario must reach a single-exit objective (marked by a flagpole or other object) within a set time limit to get to the next sequential level; the 3D games' levels, however, are less linear and allow Mario to walk around freely and gather special objects, like Power Stars and Shine Sprites, that allow him to progress further into the game. Another integral element of Mario franchise gameplay is the use of items, which Mario can use to power himself up. Often these items can be found in special item blocks, labeled with a question mark (? ), which alternatively can also yield coins. Many power-ups in the Mario games are mushrooms. The most iconic of this category of power-ups is the Super Mushroom, which increases Mario's size and allows him to break brick blocks. When hit by an enemy, Mario reverts to his smaller size instead of losing a life. While Mario is already in Super form, most blocks that would contain a Super Mushroom instead offer a more powerful power-up. The Japanese Super Mario Bros. 2 introduced the Poison Mushroom, which behaves more like an enemy, shrinking or killing Mario whenever he comes in direct contact with it. The New Super Mario Bros. series introduced two additional mushroom power-ups: the Mini Mushroom, which shrinks Mario into miniature size, allowing him to access areas he normally cannot; and the Mega Mushroom, which grows Mario into a towering, invulnerable giant who destroys enemies and the environment by running through them. Certain items exist that grant Mario an extra life. 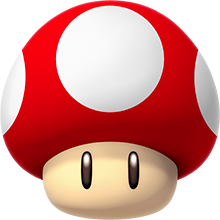 The most recurring and significant is the 1-Up Mushroom, which appears similar to the Super Mushroom but is green instead of red. It is sometimes hidden in invisible item blocks, and in the 3D games, it sometimes appears when Mario walks in a particular area. Although the 1-Up Mushroom is the most common extra life-granting item in the franchise, there are other items that serve the same or a similar function, such as the 3-Up Moon introduced in Super Mario World, which grants three extra lives instead of one. "Fire Mario" is one of the character's most common powered-up forms. There are also power-ups taking the form of flowers, which allow Mario to shoot projectiles of various kinds. 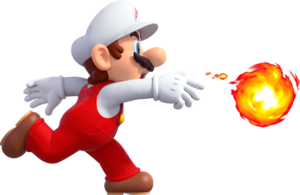 The first and most significant is the Fire Flower, which turns Mario into his fire form, in which he is able to sling bouncing fireballs at incoming enemies. Mario's fireballs instantly kill most enemies on contact, except for certain enemies which are fire-resistant, like the Buzzy Beetle. Later games introduced alternate variants of this item, such as the Ice Flower, which allows Mario to shoot balls of ice that can also freeze enemies in ice blocks to be used as platforms or projectiles; and the Gold Flower from New Super Mario Bros. 2, which turns Mario into gold and allows him to turn bricks into coins and earn bonus coins for defeating enemies. Another prominent item in the series is the Super Star (also called the Starman), a flashing anthropomorphic star which grants Mario temporary invincibility, allowing him to kill virtually any enemy upon making contact with it. Some games feature substitutes for this item, like Super Mario 64, where Mario can resist harm using the Metal and Vanish Caps; and Super Mario Galaxy and its sequel, where invincibility is provided by the "Rainbow Star," which also progressively increases Mario's speed, to the point where he becomes almost uncontrollable as his power wears off, and allows him to break through certain objects. The games often feature collectibles found in levels in order to progress in the overworld, most frequently with the visual motif of a star. They are typically situated in locations that are not readily found or reached, or awarded for completing stunts, or objectives given by NPCs. They include the Power Stars in Super Mario 64 and the Super Mario Galaxy games, Shine Sprites in Super Mario Sunshine, Star Coins in the New Super Mario Bros. games and Super Mario 3D Land, Green Stars in the Galaxy games and Super Mario 3D World, and Power Moons in Super Mario Odyssey. Flight is a common theme throughout the series, first enabled with the magic carpet item in the international Super Mario Bros. 2. The Super Leaf and Tanooki Suit items, first appearing in Super Mario Bros. 3, provide Mario with an animal-suited tail which in turn acts as a flight propeller. The Tanooki Suit returns in Super Mario 3D Land, and the Super Leaf returns in New Super Mario Bros. 2. In the New Super Mario Bros. games, the Spin Block and the Propeller Mushroom let Mario spin up into the air and slowly descend. Super Mario World has for its various forms of flight the Cape Feather, the P Balloon, and the wings that Yoshi is given after eating a blue Koopa shell. 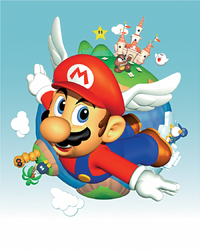 In Super Mario 64, flight is granted for a limited time by the Wing Cap, and in New Super Mario Bros. U, Mario has limited flight and gliding capabilities in his Flying Squirrel form. In Super Mario Galaxy, Mario can obtain a special red star that transforms him into Flying Mario for a limited time. Finally, Lakitu's cloud can be commandeered in several of the side-scrolling games. Coins are a common element in Mario game design, traditionally incorporated as puzzles and rewards. Most Super Mario games award the player an extra life once a certain amount of coins are collected, commonly 50 or 100. There are also special variants of Coins, such as Dragon Coins in Super Mario World, Red Coins in Super Mario 64 and a number of games afterwards; and Star Coins in the New Super Mario Bros. games. In Super Mario 64, Sunshine, and the Galaxy games, coins replenish health (and air, when Mario is underwater). In RPGs, Coins can be used to purchase items and other useful things. One of the Mario franchise's most common modes of transportation is the Warp Pipe, a drain pipe-like structure which comes in a number of different colors (the most common being green). Warp Pipes provide access to secret underground areas that often host mass amounts of Coins, and can also function as platforms that allow Mario to traverse from one area to another; some pipes even launch the hero into the air. Special well-hidden areas in early games, known as "Warp Zones," contain pipes that allow players to skip several levels and even entire worlds at once. Most 3D games in the series feature cannons that allow Mario to progress through levels and reach otherwise inaccessible areas; to use them, he jumps into the barrel, aims himself and is fired at his target. 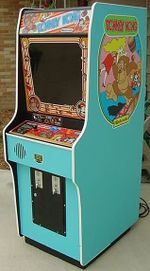 An arcade cabinet for Donkey Kong, the first game in the franchise. After the commercial failure of Radar Scope in North America, Shigeru Miyamoto was assigned to create an arcade game that would appeal to the North American market. Miyamoto came up with the idea of a game in which the playable character has to make his way through an obstacle course consisting of sloped platforms, ladders and rolling barrels. He named the game Donkey Kong, which was originally released on July 9, 1981, and is an early example of the platform genre. In addition to presenting the goal of saving Lady (later renamed Pauline), the game features a scoring system where points are awarded for finishing screens, leaping over obstacles, destroying objects, collecting items, and completing other tasks. The game was surprisingly successful. The player character did not originally have a permanent name, so when Nintendo of America was requested to name him by Nintendo of Japan, it was decided that his namesake would be the Italian-American landlord of storage and company housing, Mario Segale. The success of the arcade game spawned ports to numerous platforms such as the ColecoVision and the Atari 2600. A direct sequel to this game, Donkey Kong Jr., was released the following year; it was the only game to feature Mario as the antagonist, in which role he kidnaps Donkey Kong and cons the ape's son into saving him. Another sequel, Donkey Kong 3, was released in October 1983 and was a shooting game that featured an exterminator named Stanley as the hero instead of Mario, whose role is to defend a greenhouse from Donkey Kong. The Mario branding was used for the first time in Mario Bros., released to the arcades in 1983, where Mario was paired with a recolor that became his brother Luigi. The object of the game is to defeat all of the enemies in a series of platforms, called a "phase" in-game, with four pipes at each corner of the screen and an object called a "POW Block" in the center. The gameplay mechanics involve only running and jumping; in this game, enemies cannot be jumped on until Mario or Luigi flips them over, either by jumping under the platform they are on or with a POW Block. Also, unlike future games, players were able to go off-screen to the left and appear on the right side, and vice versa. The game was reimagined as Mario Clash, released for the Virtual Boy in 1995, and received a remake that appears as a minigame in all entries of the Super Mario Advance series. As part of the "Year of Luigi" celebration in 2013, Super Mario 3D World also includes a port of the NES release, titled Luigi Bros., in which both characters are Luigi (using his original sprite and an edited sprite based on his modern appearance). Nintendo released eleven Mario-relevant LCD electronic games as part of the Game & Watch line between 1982 and 1991. In the late 1990s and early 2000s, Nintendo released four "Game & Watch Gallery" games on the Game Boy, featuring a combined sixteen Game & Watch handheld games in both their original forms and new "Modern" versions which feature updated graphics and enhanced gameplay, and replace the generic Game & Watch characters with the characters of the Mario series. Super Mario Bros., the flagship game of the Mario franchise, was largely responsible for the early success of the NES and the revival of the North American video game industry after the 1983 market crash. The game is represented here with this promotional artwork drawn by Miyamoto himself. In 1985, Mario became the star of his own side-scrolling platform game called Super Mario Bros., which was the pack-in title for the Nintendo Entertainment System. The game centers around Mario's quest to save the Mushroom Kingdom and Princess Peach (then known to the Western world as Princess Toadstool) from Bowser and the Koopa Troop. To save the princess, Mario conquers the eight worlds of the Mushroom Kingdom by going to the castle in each to defeat Bowser and his minions. The plot of Bowser kidnapping the princess has been repeatedly reused throughout the subsequent games in the core Super Mario series. Super Mario Bros. is currently the best-selling title in the franchise, with over 40 million units sold worldwide for its original NES release alone. A direct follow-up to Super Mario Bros., with significantly more challenging levels, was released in Japan in 1986 for the Famicom Disk System add-on. However, Nintendo of America deemed the game far too difficult for Western gamers and instead released its own Super Mario Bros. 2 in 1988, this title being an altered version of the unrelated Famicom Disk System title Yume Kōjō: Doki Doki Panic ("Dream Factory: Heart-Pounding Panic"). In this game, Mario travels the dream world of Subcon with Luigi, the princess, and Toad to free the land from the curse of an evil frog king named Wart. Two years later, the next mainstream Mario game was released: Super Mario Bros. 3. Here, Mario goes on a quest to save the rulers of the seven kingdoms in the Mushroom World from the Koopalings (then portrayed as Bowser's children), travelling across these kingdoms to restore order. When Mario finishes saving the Mushroom World, Bowser kidnaps Princess Peach, and Mario must traverse his kingdom and storm his castle in order to rescue her. In 1991, Mario was revolutionized once again for the Super Nintendo Entertainment System, with the launch title Super Mario World. Peach is once again kidnapped while on vacation with Mario and Luigi in Dinosaur Land, and the brothers must once again foil Bowser and the Koopalings. Several of the native Yoshis have also been trapped inside of eggs, and help Mario on his quest by allowing him to ride them. In 1993, a game called Super Mario All-Stars was released on the SNES, which compiled the entire NES Super Mario Bros. trilogy into one cartridge, adding a save system to these games and enhancing the graphics and audio of all three for the more powerful console; additionally, the cartridge included a remake of the Japanese Super Mario Bros. 2, labeled in-game as "The Lost Levels," introducing that game to Western audiences for the first time. The Game Boy had its own series of three Mario platformers, titled Super Mario Land. This series' first entry was released in 1989 as one of the handheld's launch titles, and became its best-selling game despite not being bundled with the system. It follows Mario as he travels through Sarasaland, a kingdom with four geographical areas, to corner the alien Tatanga and rescue the region's kidnapped ruler, Princess Daisy. A sequel, subtitled 6 Golden Coins, was released in 1992 and had Mario working to save a land he ruled over from an evil spell conjured by his childhood friend turned rival, Wario. That character became so popular that the following year, the third game in the Super Mario Land series shifted the attention to him, spawning the Wario Land sub-series. Neither the Game Boy Color nor the Game Boy Advance received any original mainstream Mario games, only ports and remakes of NES and SNES games. Super Mario 64 was the first fully 3D entry in the Mario franchise, and one of the first full 3D releases for Nintendo overall. In 1996, the Nintendo 64 console debuted with Super Mario 64 as a launch title, one of the first fully 3D console games, and the first game to feature the Mario characters in their 3D rendered versions. Peach sends Mario a letter inviting him to her castle; however, when he arrives, Mario discovers that Bowser has invaded the castle and imprisoned the princess and her servants within it using the castle's Power Stars. Many of the castle's paintings are portals to other worlds, which Mario explores to recover the stars from Bowser's minions. The game was followed up in 2002 with Super Mario Sunshine, for the Nintendo GameCube. There, Mario and Peach take a vacation to the tropical resort called Isle Delfino, which has been vandalized and polluted by a mysterious figure similar in appearance to Mario. Mario is arrested and ordered to clean up the island; in the process, he seeks the help of F.L.U.D.D., a robotic water pump, and must also collect the Shine Sprites, which the pollution has caused to flee the island's main plaza. Eventually, Peach is kidnapped by Shadow Mario, who later reveals himself to be Bowser's son, Bowser Jr., and Mario must confront him, along with Bowser senior, to rescue the princess. The New Super Mario Bros. games marked a revival of 2D Mario platformers after over 10 years. In 2006, a 2.5D retro throwback sub-series called New Super Mario Bros. was inaugurated for the Nintendo DS. Beyond the first game, the sub-series has continued with follow-ups on the Wii, Nintendo 3DS, and Wii U. The games in the series are similar in structure and gameplay to the original 2D games, and as such have generally minimalist stories, where Bowser simply kidnaps Peach and provokes Mario to give chase, venturing through eight worlds as in the original Super Mario Bros., and eventually do battle with him to rescue the princess. In the Wii and Wii U versions, four players can simultaneously control their characters; the Mario brothers are accompanied as playable heroes in these games by two Toads, one blue and the other yellow. In 2007, the mainstream Mario series continued for the Wii with Super Mario Galaxy, today recognized as the franchise's most critically acclaimed game of all time. While Mario prepares to attend the Mushroom Kingdom's centennial "Star Festival," Bowser invades and uproots Peach's castle, carrying it into space toward the "center of the universe." In space, Mario meets star-like creatures called Lumas and their guardian Rosalina, who tells Mario that he must recover the Power Stars―the power source for her mobile observatory―from the Koopa Troop in order to reclaim Peach from Bowser's "galaxy reactor" in the center of the universe. The game was followed up in 2010 with a sequel that features a loosely similar plot; this time, Bowser uses the Power Stars to become a giant, and Mario navigates through the galaxies and eventually to Bowser's lair using a "Starship", or mobile planet, in the shape of his head. In 2011, the series would receive a new type of 3D platformer with Super Mario 3D Land for the Nintendo 3DS. Developed to appeal to fans of the 2D games, the game combines elements of the 3D Mario platformers with those of the 2D side-scrollers, and a plotline involving Peach being kidnapped by Bowser. This game would also be followed up in 2013 with Super Mario 3D World for the Wii U, which incorporates four-player simultaneous multiplayer for the first time in a 3D Mario game. 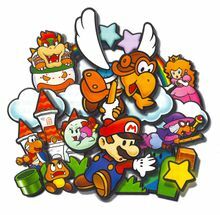 In this game, Bowser has taken over the Sprixie Kingdom, having captured its seven princesses, and Mario and friends journey through the realm to save it from Bowser's rule. In 2016, the team behind New Super Mario Bros. released Super Mario Run, Nintendo's first real smartphone game, which was one of the few instances a Mario game was developed for non-Nintendo hardware. In the game Mario automatically runs through stages, while the player must tap on the screen to have him jump. A new game titled Super Mario Odyssey was released for the Nintendo Switch console in 2017. The game marks a return to the original open-ended, exploration-based style of 3D Mario games as seen in Super Mario 64 and Super Mario Sunshine. Mario travels through different kingdoms, such as a metropolis that resembles New York City, a sand-filled country which shares inspirations from Mexico and Egypt, and a wooded forest with mechanical elements. During his adventure, the hero's hat is possessed by his newest ally, Cappy, which allows him to throw it like a long-range weapon and use it to capture and possess certain objects and enemies. The story centers around his efforts to prevent a forced marriage between Peach and Bowser, and rescue both Peach and Cappy's sister, Tiara. Mario in his "doctor" persona. Dr. Mario (ドクターマリオ Dokutā Mario) is an arcade-style action puzzle game series originally developed by Nintendo Research & Development 1, and later developed by Arika and produced by Nintendo Software Planning & Development. 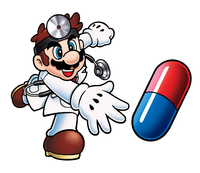 It casts Mario as a medical doctor who must eradicate deadly viruses; the player's objective is to destroy the viruses populating the on-screen playing field by using falling colored capsules that are dropped into the field, similarly to Tetris. The player manipulates the capsules as they fall so that they are aligned with viruses of matching colors, which removes them from the playing field. The player progresses through the game by eliminating all the viruses on the screen in each level. The first Dr. Mario game was launched in 1990 on the NES and the Game Boy to critical and commercial success. It has spawned five original follow-ups, three for home consoles and one a handheld game. To keep the brand fresh, each follow-up has introduced new gameplay elements and modes. After an eleven-year hiatus, the sub-series returned in 2001 with Dr. Mario 64 for the Nintendo 64, which introduced three new game modes ("Story," "Score Attack," and "Marathon"), added Wario as a playable character alongside Mario, and updated the multiplayer functions to allow up to four people to play. Two additional Dr. Mario games were launched in 2008: Dr. Mario Express for the Nintendo DSi's DSiWare service, and Dr. Mario Online Rx for the Wii's WiiWare service; the latter introduced online multiplayer to the series. In 2013, a Wii U game called Dr. Luigi, available on Nintendo eShop, gave Luigi his own "doctor" persona and featured an "Operation L" game mode in which all capsules assume the shape of the letter L. Finally, Dr. Mario: Miracle Cure was released for the Nintendo eShop on Nintendo 3DS in 2015. In addition to all of the returning game elements from previous installments, this game introduces the Miracle Cure, which can have a variety of different effects to help destroy multiple Viruses at once. Mario's Picross is a Game Boy game released in 1995 which features a nonogram logic puzzle system, where there is a 100-square screen for the player to maneuver around. Each row and column comes with a number that refers to the amount of squares that need to be marked within the grid. Mario is portrayed as an archaeologist who chisels away to form the images on the grid. The game was poorly received in the West, but in Japan, it was successful enough to spawn two sequels: one on the SNES, and another on the Game Boy. Illustration created for Mario Kart 8 showing Mario racing in his go-kart. Mario Kart (マリオカート Mario Kāto) is a series of go-kart racing games developed by Nintendo Entertainment Analysis and Development. 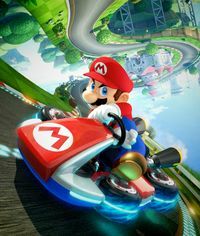 It is possibly the franchise's most popular spin-off series; since its inception, it has become the most successful and longest-running kart racing series in gaming history, and has sold over 100 million copies worldwide. Players compete in go-kart races, controlling one of a selection of pre-established Mario characters, and use various power-up items obtained by driving into item boxes laid out on the course. Different items assist the player-characters in different ways; for example, the Super Mushroom gives players a speed boost, the shells of Koopa Troopas are thrown at opponents to stun them, and banana peels can be laid on the track as hazards. There have been a total of 13 games in the Mario Kart series: six for home consoles, three portable games, and four arcade spin-offs developed by Bandai Namco, generally considered separate from the Nintendo titles. The series' first entry, Super Mario Kart, was released in 1992 for the SNES and was critically and commercially successful. As the series has progressed, new course types, items, playable characters, and other elements have been introduced to keep the experience fresh. In 1996, Mario Kart 64 for the Nintendo 64 introduced four-player racing and 3D graphics. This was followed up in 2001 with Super Circuit for the Game Boy Advance, which featured unlockable retro tracks from the first installment. In 2003, Double Dash!! for the GameCube introduced a co-operative LAN multiplayer mode and was the only entry to feature two-person karts. Mario Kart DS, released in 2005, introduced dual-screen play and online multiplayer via Wi-Fi; additionally, the use of unlockable retro tracks from previous installments was reintroduced and made a permanent feature of the series. In 2008, Mario Kart Wii introduced motion controls, 12-player racing, motorbikes, stunts, and playable Mii characters. In 2011, Mario Kart 7 for the Nintendo 3DS featured optional stereoscopic graphics, and introduced hang gliding, submersible karts, an alternate first-person perspective, and kart customization. Mario Kart 8, released for the Wii U in 2014, introduced anti-gravity racing, ATVs, and downloadable content; allows highlights to be uploaded to YouTube via "Mario Kart TV"; allows up to four people to play in Grand Prix races; and is the first game in the series to boast HD graphics. The game was ported to the Switch in an enhanced Deluxe edition in 2017; this release introduced a third mini-turbo boost level called "Ultra Mini Turbo," and more accessible options for beginners, such as "smart steering" (which allows the kart to avoid off-road areas) and auto-acceleration. The four Bandai Namco arcade installments comprise a sub-series known as Mario Kart Arcade GP, and consists of four installments: Mario Kart Arcade GP, Mario Kart Arcade GP 2, and Mario Kart Arcade GP DX, and Mario Kart Arcade GP VR. These titles have different features from the main installments, such as a timer similar to other arcade racing games, many more items than the normal installments, and the inclusion of characters from Bandai Namco series such as Pac-Man, Tamagotchi, and Taiko no Tatsujin. The first role-playing game in the Mario franchise, Super Mario RPG: Legend of the Seven Stars, was released in 1996 for the SNES to critical acclaim. Developed by Squaresoft before it merged with Enix, it contains gameplay elements similar to or inspired by Square's Final Fantasy series. 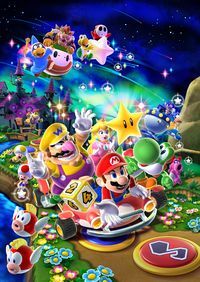 The story focuses on Mario as he, with the help of four other characters, seeks to eliminate the game's main antagonist, Smithy, who has stolen the seven pieces of the Star Road where all the wishes of the world's inhabitants are turned into stars; Mario must return the pieces so these wishes may again be granted. The two Mario RPG series that followed this game, the Paper Mario and Mario & Luigi series, have been considered informal sequels and spiritual successors to this game. The Paper Mario series depicts characters in an alternate art style with a "paper-like" feel. Paper Mario (ペーパーマリオ Pēpā Mario) is developed by Intelligent Systems and launched its first installment on the Nintendo 64 in 2000, to critical and commercial success. In the Paper Mario series, the player controls an alternate-style depiction of Mario in a mixture of 3-dimensional environments and 2-dimensional characters who look as if they are made of paper. This version of Mario can jump and use his hammer to overcome physical obstacles placed in the game's overworld, and combat enemies in turn-based battles. In battles, the player can influence the power of a move when attacking or defending by timing a button-press accurately or performing some other action command as required, similar to the "timed hits" mechanic in Super Mario RPG. Progression through these games depends upon interaction with the game's non-player characters (NPCs), who will often offer clues or detail the next event in the storyline. In the first three games, Mario accumulates partners with specialized skills, who also assist him in battle. The series' original formula is similar to those of traditional RPGs, involving special moves that consume a particular number of points when performed, badges that yield bonuses like added moves or gradual health restoration, and an experience-point system that allows Mario to level up either his health, his special-moves points, or his badge points. There have been four Paper Mario games released for home consoles and one portable game. As time has passed, each game has introduced new elements in order to keep the gameplay fresh; since 2012, however, the stories and character rosters have been significantly toned down from what they were in the first three games. The original Paper Mario for Nintendo 64 is set in a paper-based version of the Mushroom Kingdom, where Mario tries to rescue Peach from Bowser, who has imprisoned the seven Star Spirits, lifted her castle into the sky, and has successfully defeated his foe after stealing the Star Rod from Star Haven and making himself completely invulnerable. To save Mushroom Kingdom, rescue Peach, get the castle back, and defeat Bowser, Mario must locate the Star Spirits, who can negate the effects of the stolen Star Rod, by defeating Bowser's minions who are guarding them. In the sequel, Paper Mario: The Thousand-Year Door, released in 2004 for the GameCube, Mario quests to retrieve seven Crystal Stars and rescue Peach from the secret society of the X-Nauts and their cybernetic leader, Sir Grodus. In this game, Mario gains the ability to fold himself up into things like a paper airplane and a boat to interact with the overworld. In 2007, Super Paper Mario was released on Wii, which deviated into the 2D action RPG genre and introduced the ability to "flip" into a 3D perspective in which the level rotates to reveal a hidden z-axis, placing Mario in a 3D environment; the plot follows Mario's quest to collect eight Pure Hearts in order to prevent Count Bleck, the main antagonist, from destroying the universe. In the first two installments, Peach is a secondary playable character, with Bowser joining her in The Thousand-Year Door; in Super Paper Mario, not only these two but also Luigi function as secondary playable characters with their own sets of abilities independent of Mario's. In 2012, Paper Mario: Sticker Star for the Nintendo 3DS introduced the use of stickers in the environment and turn-based battles, which can be found and peeled off from various areas in the overworld or purchased/received from NPCs. The game's story involves Mario retrieving the six Royal Stickers, which have been scattered after Bowser attempted to steal the Sticker Comet. A 2016 follow-up for Wii U, Paper Mario: Color Splash, functions similarly to Sticker Star but with colors instead of stickers. Mario's quest involves him retrieving the stolen Big Paint Stars on Prism Island, which has been mysteriously drained of color. Mario and Luigi in the unique art style of the series, with Starlow, a character who acts as their travel companion within the majority of these games. The Mario & Luigi series, developed by AlphaDream, is formed of several role-playing games for Nintendo's handheld systems. The series features games with long, detailed stories full of battles that the Mario brothers must endure in order to progress through the game with ease; as in the Paper Mario series, the battle system emphasizes timing and more elaborate attacks. Compared to other RPGs, the tone of the Mario & Luigi games is generally more whimsical and lighthearted, with various in-game jokes and comical references to the heritage of the Mario franchise. With the exception of Paper Jam, Bowser is a side antagonist but lends his form for the games' final bosses. The first game in the sub-series, 2003's Mario & Luigi: Superstar Saga for the Game Boy Advance, has Mario and Luigi travel to a foreign land called the Beanbean Kingdom, where they combat a witch named Cackletta and her assistant Fawful, who have stolen Princess Peach's voice and are plotting to take over the realm by using her voice to awaken the Beanstar. In 2005, Partners in Time for the Nintendo DS was released. The game places an emphasis on time travel as the protagonists journey between the past and present of the Mushroom Kingdom. Mario and Luigi encounter their younger selves and work with them to search for Peach, who has been abducted by an alien species called the Shroobs that conquer the Mushroom Kingdom in the past. In 2009, Bowser's Inside Story, also for the DS, makes Bowser the main protagonist, who tries to foil Fawful's takeover of the entire kingdom; Mario and Luigi, who have been inhaled into the body of their long-time nemesis, find ways to assist him despite him being unaware of their presence. The Nintendo 3DS has seen four entries in the Mario and Luigi series (two original games and two reissues). In 2013, Dream Team introduced "Dreamy Luigi," where Luigi sleeps in the Dream World, as part of the "Year of Luigi" celebration. Mario, Luigi, Princess Peach and her attendants head to Pi'illo Island for a vacation, but find that it must be saved from Antasma, who seeks the Dream Stone. Paper Jam, released in 2015, was a crossover game in which the paper incarnations of the Mario cast seen in the Paper Mario series are brought into the world of Mario & Luigi. After the two Bowsers team up to conquer the Mushroom Kingdom, Mario and Luigi team up with Paper Mario in order to stop them. In 2017, a remastered version of Superstar Saga was released as the 3DS' third entry, with an added story called "Minion Quest: The Search for Bowser," involving the Koopa Troop's attempts to rescue Bowser from the problems he gets into during the course of the main plot, while confronting and teaming up with the creatures of the Beanbean Kingdom. Bowser's Inside Story was given the same treatment for its 10th anniversary in 2019, with its added subplot incorporating Bowser Jr. into the storyline. The Mario Party series allows players to compete in board games as one of a selection of major Mario characters. Mario Party (マリオパーティ Mario Pāti), a party game series, has four human- or computer-controlled characters compete in a board game interspersed with minigames. The series is known for its party game elements, including the often-unpredictable multiplayer modes that allow play with up to four (and sometimes eight) human players. The Mario Party series was originally developed by Hudson Soft until several of its key designers left the company, leading to its eventual disestablishment. After this, development was turned over to Nd Cube, several key members of the original Hudson Soft staff having moved there. The series consists of the original 1999 Mario Party on Nintendo 64, nine numbered sequels on home consoles, five handheld games (Advance, DS, Island Tour, Star Rush, and The Top 100), and Super Mario Party for the Switch. The Mario Party brand has also been licensed into three Japan-only arcade games developed by Capcom: Super Mario Fushigi no Korokoro Party ("Super Mario: Wonderful Rolling Party"), released in 2004; a sequel to the aforementioned game, released the following year; and Mario Party Fushigi no Korokoro Catcher ("Mario Party: Rolling Wonder Catcher"), released in 2009. The Mario Tennis series has spawned installments on almost every Nintendo console since the Nintendo 64. Mario appeared in Nintendo's first tennis game, originally released for the NES and later ported to the Game Boy; there, he only appeared in the capacity of a cameo as the referee. The first tennis game to use the Mario branding was Mario's Tennis for the Virtual Boy. The main Mario Tennis series, developed by Camelot, was launched in 2000 with its first installment on the Nintendo 64 (with a Game Boy Color counterpart releasing soon afterward), and spawned a number of subsequent games: Mario Power Tennis for the GameCube, Mario Tennis: Power Tour for the Game Boy Advance, Mario Tennis Open for the Nintendo 3DS, Mario Tennis: Ultra Smash for the Wii U, and Mario Tennis Aces for the Switch. Though the Virtual Boy Mario's Tennis simply focused on tennis fundamentals, Camelot's Mario Tennis series adds gameplay elements not present in traditional tennis, such as power-up items, power shots, and external obstacles interfering with the game. 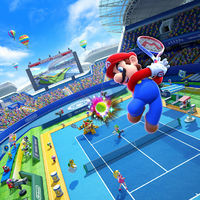 Camelot's first- and second-generation Mario Tennis titles feature ready-made human characters created by the company specifically for these games, never to appear again. The golfer in Nintendo's first golf game for NES (later ported to Game Boy) was a mustached man resembling Mario; in the Western version, this golfer is Mario himself, though his identity would later be retconned. A later game, NES Open Tournament Golf, featured Mario and Luigi as the golfers, with Peach and Daisy as their respective caddies. The main Mario Golf series, developed by Camelot, was launched with its first installment on the Nintendo 64 in 1999 and followed up with a Game Boy Color version later in the year. Later follow-up games include Toadstool Tour for the Nintendo GameCube, Advance Tour for the Game Boy Advance, and World Tour for the Nintendo 3DS. Camelot's Mario Golf games feature a home-console-to-handheld linking capability and add a number of recognizable Mario elements as obstacles to give the gameplay some originality. As was the case with Mario Tennis, Camelot's first two Mario Golf titles and their handheld counterparts featured original human characters that were never reused in any future games. The first use of Mario characters in a baseball title was in the Game Boy port of the Baseball game that served as the launch title for the NES, where Mario and Luigi were featured as team captains. The actual Mario Baseball series, developed by Namco, had two entries: Mario Superstar Baseball for the GameCube, and Mario Super Sluggers for the Wii. This sub-series features more playable characters in a single game than in any other spin-off title, with a total of more than forty in Super Sluggers. The Mario Strikers series (known as the Mario Football series in Europe) is a soccer-based series developed by Next Level Games. The series has only two installments: Super Mario Strikers on GameCube, and its follow-up game Mario Strikers Charged for Wii. Before the Strikers series, Mario and friends first played soccer in one of the minigames in the earlier GameCube game Mario Party 4. A major feature of the Mario vs. Donkey Kong games is the use of "Mini Marios," miniature toy versions of Mario. Mario vs. Donkey Kong was launched in 2004 with a Game Boy Advance title, which marked the reestablishment of the long-abandoned rivalry between Donkey Kong and Mario. The game was later followed up by March of the Minis and later Mini-Land Mayhem! for the DS, Minis March Again! on DSiWare, Minis on the Move! for 3DS, and Tipping Stars and Mini Mario & Friends: amiibo Challenge for the 3DS and Wii U. The later installments of the series reintroduced Pauline, Mario's first damsel-in-distress, now no longer described as his love interest; and featured the "Mini Marios," miniature toy versions of Mario, as the player-characters instead of Mario himself. The series traces its origins to 1994 Game Boy game Donkey Kong, which begins with the pretense of being a reissue of the arcade original but adds 96 completely different levels and gives Mario an expanded moveset. In the early 1990s, many educational games were released in the Mario series, which sought to teach miscellaneous skills such as typing, mathematics, or history. Despite being licensed by Nintendo, they are not officially recognized by the company, as it had limited involvement in their production. The first of Mario's edutainment games, Mario Teaches Typing, was produced in 1991 by Interplay Entertainment and was released for MS-DOS, Windows, and Macintosh computers; a sequel was released by Interplay's Brainstorm studio in 1996. Mario is Missing!, a geography-centered platformer produced by The Software Toolworks (a subsidiary of Mindscape) for PC, NES, and SNES, features Luigi as the main protagonist attempting to foil Bowser, who has imprisoned Mario in his Antarctic castle, sent his soldiers to steal important landmarks from many of the world's major cities, and plans to use mail-order hairdryers to melt Antarctica and flood the entire earth. Shortly thereafter, the company released a follow-up to Missing!, called Mario's Time Machine, which features Mario as the protagonist who travels through time to return major historical objects and artifacts that Bowser has stolen and assembled into his personal museum, in order to prevent the Koopa King from irreversibly damaging world history. Finally, in 1994, Toolworks released a three-game Mario's Early Years! series which was aimed at small children and was meant to teach them the basics of real-world education, such as numbers, counting, the English alphabet, and spelling among others. The educational Mario games that Toolworks produced were loosely linked through the Mario Discovery brand. Mario is featured as the main character of the 1985 NES game Wrecking Crew. 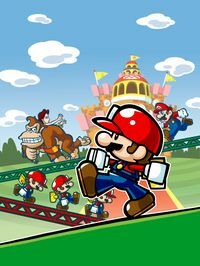 The game features Mario as he works on a demolition site, with the goal being to break every wall on each stage while avoiding enemies such as Gotchawrenches, Eggplant Men, and Spike, the site's foreman. The game would receive a sequel, Wrecking Crew '98, which was released exclusively for the Super Famicom in Japan over the Nintendo Power service in 1998 and would later be released as a standalone cartridge later that year. This game features a story mode, in which Mario must stop Bowser from building a series of high-rises across the Mushroom Kingdom. In 1992, a creativity game called Mario Paint was released for the SNES and took advantage of its mouse. The main game functions similarly to graphics-related computer software, but also allows the user to incorporate predrawn sprites called "stamps," some of which are ripped directly from the graphics data of Super Mario World. There is also a "music mode" that allows users to make their own music samples, and a minigame called "Gnat Attack" where the player can use the SNES mouse to swat different fly-like enemies. Mario Paint later inspired a three-game Mario Artist series for the Nintendo 64DD, a failed add-on of the Nintendo 64; and Super Mario Maker, a Wii U game that allows players to create their own 2D Mario levels using a variety of objects, backgrounds, and game styles (which would later receive a Nintendo 3DS port). In 2001, the Japanese sewing machine company Jaguar released a piece of embroidery software called Mario Family for Game Boy Color, which when the handheld was linked to Jaguar's JN-100 sewing machine, would allow the user to choose from a number of designs, which are copied from official Mario artworks of the classic hand-drawn era. Later in 2001, when Nintendo released the Nintendo GameCube, one of its launch titles was Luigi's Mansion, where as in Mario is Missing! before it, Luigi is the main protagonist instead of Mario. The game takes place in a haunted mansion that Luigi wins in a contest that he never entered. Mario has gone missing while investigating the mansion, so Luigi must find him with the help of Professor E. Gadd, a paranormal scientist studying the ghosts in the mansion. The scientist equips Luigi with a vacuum cleaner called the Poltergust 3000, with which he must capture every ghost in the mansion, and eventually corner their leader, King Boo. A sequel to this game, Luigi's Mansion: Dark Moon, was released in 2013 as part of the "Year of Luigi" celebration. In this game, King Boo has escaped and shattered the Dark Moon, causing the normally peaceful ghosts of Evershade Valley to become wild. E. Gadd once again enlists the help of Luigi, equipped with the upgraded Poltergust 5000, to stop the ghosts, this time across five mansions. In 2015, an arcade spinoff was released by Capcom. In 2005, the franchise saw a role-reversal with Super Princess Peach for the Nintendo DS. Developed by the behind-the-scenes studio TOSE, it casts Peach as the main protagonist, who uses Perry the talking parasol and her own powers of emotion in the form of Vibes to save Mario, Luigi, and several Toads from Bowser, who has imprisoned them on Vibe Island. In 2014, Nintendo released Captain Toad: Treasure Tracker for Wii U, a puzzle-platforming game based on the "Adventures of Captain Toad" stages in Super Mario 3D World, retaining the main gimmick in that the player is unable to jump, though in this game they can attack by picking up and throwing objects. The heroes Captain Toad and Toadette go on a quest for treasure, but must save each other from a treasure-seeking bird named Wingo. 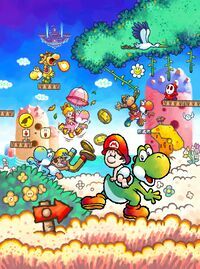 Illustration showing some of the main recurring elements of the Yoshi's Island series, created for its DS installment. One of the most closely linked partner franchises to Mario is the Yoshi franchise, composed of various platform and puzzle games. In addition to Nintendo, its games have been developed by such other companies as Game Freak, Intelligent Systems, Artoon, Arzest, and Good-Feel. The series was conceived after its eponymous character gained mass popularity from his debut appearance in Super Mario World. The "main" branch of the Yoshi series―that in which he is featured in playable main-character roles―was established in 1995 with Super Mario World 2: Yoshi's Island for the SNES, which introduced the main staples of Yoshi's independent universe; in this game, Yoshi and his friends tote Baby Mario around their island to reunite him with Baby Luigi, who along with the stork that was supposed to deliver the two brothers was kidnapped by the Magikoopa Kamek, who is caring for an infant Bowser. Yoshi's Island has since spawned six follow-up adventures, one of which, Yoshi's Island DS, introduced infant versions of several other recurring Mario characters. Other Yoshi games include a 1991 falling-block puzzle game for NES and Game Boy; the tile-matching game Yoshi's Cookie, developed by Blue Planet Software (then called Bullet-Proof Software); and a dedicated light gun shooter called Yoshi's Safari, which made use of the SNES Super Scope. After Wario gained his share of popularity from his debut in Super Mario Land 2, he was spun off into his own franchise. The third Super Mario Land game, released in 1993, focused its attention on him, and kicked off a platforming series called Wario Land, spawning three numbered sequels on handhelds, a Virtual Boy adventure, and Wario Land: Shake It! on Wii. In the interim between Wario Land 4 and Shake It!, Wario starred in two additional adventures: the 3D game Wario World and Wario: Master of Disguise on DS. Wario's adventures typically involve him grubbing money and hunting for treasure in attempts to further increase his wealth. Ten years after the original Wario Land was released, a new Wario sub-series was added, called WarioWare, in which Wario, motivated by his wish of making money, founds a video game studio and hires numerous friends of his to make short microgames for him. Since WarioWare launched on Game Boy Advance, every Nintendo system from the sixth generation onwards has contributed an entry of its own to that series, with each new entry featuring microgames that often exploit the new technological enhancements of the console or handheld for which the game is released. Although Donkey Kong debuted with Mario as his first rival, the Donkey Kong series fizzled out after the failure in the arcades of Donkey Kong 3; this original era of Donkey Kong also saw an edutainment game called Donkey Kong Jr. Math and various Game & Watch entries. It did not become its own brand and franchise independent of Mario until 1994, when Rare revived the character with its SNES side-scrolling platform game Donkey Kong Country. That game and its follow-ups focus on the adventures of Donkey Kong and the various members of his clan as they work to defend their island home from a variety of other anthropomorphic-animal characters who serve as villains. They are most frequently antagonized by the Kremlings, a race of crocodiles, and their leader King K. Rool. This spin-off series has also branched out into other genres including rhythm games (Donkey Konga) and racing games (Diddy Kong Racing). A hallmark of this series is the barrels used by the Kongs as weapons, vehicles, furniture, and lodging. Major characters of the Mario series have been staple fighters in the Super Smash Bros. series since its first installment, on Nintendo 64, was released in 1999. This all-out fighting series is not really an offshoot of the Mario franchise, however; it is more of a crossover series for all of Nintendo's major intellectual properties, and later installments even feature several characters from outside gaming companies who have appeared on Nintendo systems. In the games, players select whichever character they want, and fight against each other on a specific stage. Each character has their own unique and clearly defined moveset, and can also use items to harm others or help themselves in some way. In 2005, Nintendo signed a deal with Electronic Arts to feature Nintendo characters in EA's games. This would lead to Mario, Peach, and Luigi being included as playable characters exclusively in the Nintendo GameCube versions of NBA Street V3 and SSX on Tour. In the Mario & Sonic crossover series, Mario and friends compete in the Olympic Games alongside Sonic the Hedgehog and his various friends. In 2007, Mario characters crossed over with the characters of Sega's Sonic the Hedgehog series in a sports game called Mario & Sonic at the Olympic Games, based on the 2008 Summer Olympics in Beijing, for Wii, with a Nintendo DS version being released later. Boasting a player-character roster evenly divided among the Mario and Sonic casts, the game featured a combination of sporting events taken directly from the Summer Olympics and those exclusive to the game. A follow-up, Olympic Winter Games, was released in 2009, this time based on the 2010 Winter Olympics in Vancouver. A third title, London 2012 Olympic Games was released for Wii in 2011 and for Nintendo 3DS in 2012. In 2013, the fourth game in the series, Sochi 2014 Olympic Winter Games, was released exclusively on the Wii U, followed by the fifth title, Rio 2016 Olympic Games for the Wii U and Nintendo 3DS in 2016. Two sports games developed by Square Enix crossed over several characters from Final Fantasy into the world of Mario. The first, Mario Hoops 3-on-3, released in 2006, is a basketball game where the Mario characters play on sixteen courts distributed among four tournaments, using "special shots" to gain an advantage over unsuspecting opponents, and question-mark panels yielding items to use on foes. In 2010, this was followed up with Mario Sports Mix, where the Mario cast not only competes in basketball again, but also plays three additional sports―hockey, dodgeball, and volleyball. Mario characters have also crossed over into another Square Enix series, Fortune Street (いただきストリート Itadaki Sutorīto). This series, originally exclusive to Japan for many years, is a series of party games fashioned in a format similar to that of the board game Monopoly. 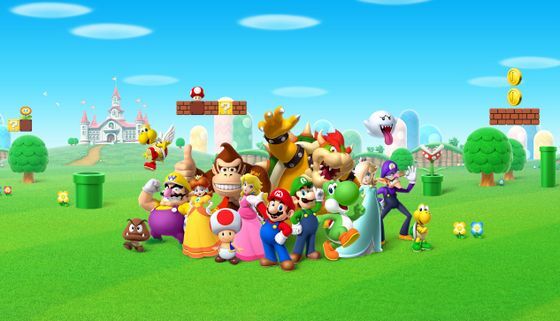 The Mario cast specifically appeared in the Fortune Street series' Nintendo DS installment, alongside several characters from Square Enix's Dragon Quest series, released in 2007; then returned in the Wii follow-up, released in 2011, which was the first to be released overseas. More recently, the Mario world crossed over into the Puzzle & Dragons series by GungHo Online Entertainment, when a Super Mario Bros. Edition of the series was released in 2015 for Nintendo 3DS. The game mixes the Puzzle & Dragons gameplay of matching icons to damage enemies with pre-established Mario characters, enemies, locations, and the use of power-ups as the icons. In a collaboration between Nintendo and Activision, Bowser and Donkey Kong are featured as playable characters in the Nintendo versions of Skylanders: SuperChargers, with their own Skylanders figures that can also double as amiibo. These figures are also compatible with the Wii U and later Nintendo Switch versions of Skylanders: Imaginators. A turn-based tactics game called Mario + Rabbids Kingdom Battle was produced by Ubisoft as a crossover between Mario and the Raving Rabbids series, and was released for the Nintendo Switch in 2017. Mario, Luigi, Peach, and Yoshi are each given their own Rabbid counterparts, who work along with them as they counter the schemes of Bowser Jr., who intends to conquer the Mushroom Kingdom by exploiting a special Rabbid who has the ability to fuse any two objects. The games in this section were both developed and published by companies other than Nintendo. Nintendo had no involvement in these titles other than licensing the underlying property; as such, they are not officially recognized by the company. In 1984, Hudson Soft released Mario Bros. Special, an original arcade-style platformer based on Mario Bros. with adjusted graphics and sound and new stages. Instead of having to defeat every enemy in the level, the game involved trying to get to the top of a level, where the exit to each level is. This was followed up later in the year by Punch Ball Mario Bros., which was exactly the same as the arcade original but involved "punch balls" that Mario and Luigi could use to hit and stun enemies, as well as a reversed platform pattern. Both of these games were released for the Japanese computers NEC PC-6001, NEC PC-8801, FM-7, and Sharp X1. In 1986, Hudson released another Special game, this one based on Super Mario Bros. and released for the PC-88 and Sharp X1. The true "lost" game of the series, Special was the first licensed sequel to Super Mario Bros., appearing only a few months before The Lost Levels. Though it is superficially similar to the original game, the levels are completely original. There is no screen-scrolling mechanism, no two-player mode, the jumping and running physics are different from the NES original, and the graphics and audio quality are altered for the PC-88's inferior technology. 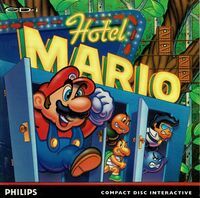 Hotel Mario is widely regarded as one of the worst games in the entire franchise. Three games using the Mario license were planned to be released by Philips' interactive media division for its CD-i machine: Super Mario's Wacky Worlds, Hotel Mario, and Mario Takes America. Only Hotel Mario was released; the other two were eventually canceled. Philips was given permission to use Nintendo characters in CD-i games due to its taking part in developing an unreleased CD add-on for the SNES. Hotel Mario was critically panned and gained very little success, if any at all. Hotel Mario, a puzzle game, was developed by Fantasy Factory and published by Philips in 1994. The primary characters of the game are Mario and Luigi, who must find Princess Peach by going through seven "Koopa Hotels" in the Mushroom Kingdom. Every hotel is divided into multiple stages, and the objective is to close all doors on each stage. The game has been criticized as one of the worst games in the series, mainly because of its cutscenes and the simplicity of its gameplay. Super Mario's Wacky Worlds was developed by NovaLogic and attempted to duplicate the gameplay of Super Mario World. Though the game sprites are based on those in Super Mario World, the level design is based on Earth locations rather than Dinosaur Land. Due to the limitations of the CD-i, several features could not be included in the game, such as large numbers of sprites on the screen, and many visual effects. Though the game was canceled, a few prototype discs exist. Mario Takes America was proposed about Mario's trip to Hollywood to make his own movie. Developed by Cigam, the game would have used full-motion backgrounds with character sprites based on cartoon animation. The concept initially impressed Philips, but was canceled due to the company being unsatisfied with the game's development progress. Six Mario games were licensed to Nelsonic Industries for use in its "Game Watch" toy line between 1989 and 1994. Super Mario Bros. & Friends: When I Grow Up was a digital coloring book released for DOS in 1991. When I Grow Up features drawings of the Mario cast (along with many cameos of characters from The Legend of Zelda) themed after various professions captioned with short blurbs on the careers depicted. Mario's Game Gallery was developed by Presage Software for Windows computers and released by Interplay in 1995. The game allows the player to play one of five games against Mario; the man who voiced Mario here, Charles Martinet, became the official voice-over artist for the Mario character. Mario's Game Gallery was later reissued in 1998 as Mario's FUNdamentals, which was compatible with Macintosh computers as well as Windows. The Mario franchise includes many alternate-media adaptations of the games, including five TV series produced by the animation studio DIC Entertainment, and numerous comics and manga. Most of these productions were released in the late 1980s and early 1990s, and have since become obscure. The games also spawned two film adaptations: an anime OVA released in 1986, and a largely unsuccessful live action film released in 1993. The Super Mario Bros. Super Show! was one of three Mario animated TV series that DIC Entertainment produced over a three-year period, between 1989 and 1991. Saturday Supercade, an animated show produced for Saturday mornings by Ruby-Spears Productions, ran for two seasons on CBS beginning in 1983. Each episode consisted of several short segments featuring characters from the golden age of arcade games. The show featured a series of 19 segments based on the Donkey Kong arcade game, in which Pauline and Mario chase Donkey Kong around the world to catch him after escaping from their circus. A lesser-shown segment series highlighted the adventures of Donkey Kong Jr. The Super Mario Bros. Super Show! is the first American series to revolve entirely around the Mario character. It was broadcast in syndication on every weekday from September 4 to December 1, 1989. The first of three Mario animated series to be produced by DIC Entertainment, it was distributed for syndicated television by Viacom Enterprises, though full rights to the series have since been returned to DIC and carried over to its successors. The show featured live-action segments where Mario and Luigi (played by Lou Albano and Danny Wells respectively), living in their basement workshop in Brooklyn, are often visited by various celebrity guest stars; and animated segments, based on Super Mario Bros. and Super Mario Bros. 2, where the brothers team up with Princess Toadstool and Toad to battle "King Koopa" (a merger of Bowser and Wart) and his forces to save the many lands of the world. On Fridays, the show would instead air an episode of The Legend of Zelda as its animated segment. Reruns of the Super Show after its initial airing rebranded the series as Club Mario, replacing the live-action segments with the adventures of two Mario-loving slackers named Tommy Treehugger and Co M.C. King Koopa's Kool Kartoons, a live action children's television show, was broadcast in Southern California during the holiday season of 1989/1990. A live-action version of King Koopa read fan mail, hosted quizzes for the TV audience, and showed public-domain cartoons irrelevant to the themes of the Mario franchise. The 30-minute program was originally broadcast during the after-school afternoon time-slots on Los Angeles-based KTTV Fox 11. The Adventures of Super Mario Bros. 3 originally aired on NBC on Saturday mornings from September 8 to December 1, 1990. It was based on Super Mario Bros. 3, taking the basic premise of the Super Show and morphing the atmosphere to create a more fitting link between the show and the game. Like the previous Mario cartoon series, the animation was done by Sei Young Animation Co., Ltd., however this show was co-produced by Reteitalia S.P.A., leading to slight differences in character design. A show called The Super Mario Challenge aired on The Children's Channel in the United Kingdom on weekday afternoons in 1990 and 1991. The show was a game show hosted by John Lenahan, who would be dressed as Mario. Two guest players had to do tasks, all of which involved playing the Super Mario Bros. games. Initially, only the first and second games were included; but Super Mario Bros. 3 was added in 1991 after its release in Europe. Rounds included challenges to see which player could complete a level in the fastest time and who could collect the most gold coins on a certain level. Super Mario World was DIC's third and last Saturday morning cartoon based on Mario, and was based on the SNES game of the same name. The show was originally aired on Saturday mornings on NBC in the 1991–92 season. It was featured in a half-hour time slot with a shortened version of Captain N: The Game Master. Episodes of Super Mario World were later shown as part of the syndication package Captain N & The Video Game Masters. After the cancellation of Captain N, the series was split therefrom, and episodes of both it and the Super Show were shown in time-compressed reruns on a compilation program called Mario All-Stars in 1994. The Super Mario Bros. live-action film, the first major live-action motion picture to be based on a video game, was a commercial and critical failure. The Super Mario Bros. film, released on May 28, 1993, is a science fiction live-action movie adaptation of the series, loosely based on the games, and the first Hollywood adaptation of a video game property. The film starred Bob Hoskins and John Leguizamo as Mario and Luigi respectively (both considered separate from the original video game characters), Dennis Hopper as "President Koopa" (representing Bowser), and Samantha Mathis as a young woman named Daisy (unrelated to the character from the games). 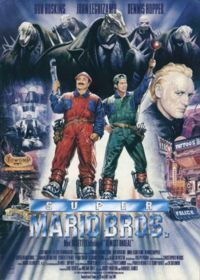 The movie's plot centers around the Mario brothers, a pair of down-on-their-luck plumbers from Brooklyn, as they discover a parallel universe called "Dinohattan", dictated by President Koopa, who seeks to merge the two dimensions together so that he can rule both worlds, leaving it up to the heroes to stop Koopa with help from Daisy, who finds out that she is the daughter of the world's displaced king. The film was a box office bomb, grossing only $20.9 million on a $48 million budget, and was panned by critics, with a 15% aggregate score on Rotten Tomatoes. However, it did receive two Saturn Award nominations, one for Best Costume and the other for Best Makeup. The film has since gained a cult following, leading to future re-releases and a fan-made sequel comic supervised by one of the movie's original writers. Super Mario Bros.: Peach-hime Kyushutsu Dai Sakusen! (subtitle translated as "The Great Mission to Rescue Princess Peach") was a Japan-only anime film released on July 20, 1986. Directed by Masami Hata and produced by Masakatsu Suzuki and Tsunemasa Hatano, it stars Mario and Luigi, who get stuck in a video game world, in which they must save Princess Peach and the Mushroom Kingdom from Bowser, who plans to marry the princess. A manga adaptation of the film was published around the same time as the film's release. A three-episode OVA series, Amada Anime Series: Super Mario Bros., was released in August 1989 featuring the Mario characters re-enacting three popular fairy tales: the stories of Momotarō, Issun-bōshi, and Snow White. In these episodes, Mario plays the heroes, Peach the damsels, and Bowser the villains; supporting roles are taken by other Mario characters. Toei Animation produced two public service announcement short films using the Mario characters. Super Mario no Shōbōtai, a fire safety video, featured Mario and Luigi teaching children not to play with dangerous objects that could start fires and other ways to prevent them from starting. Super Mario no Koutsuu Anzen, a traffic safety video, had Mario teach children how to safely cross the road. These films were only distributed to schools in Japan in 1989. Super Mario World: Mario to Yoshi no Bōken Land (subtitle translated "Mario & Yoshi's Adventure Land") was an interactive anime video based on Super Mario World. The video is meant to be used in conjunction with Bandai's "Terebikko", a phone-shaped microphone that allows viewers to input answers to questions asked during the video. A highly obscure 1995 educational VHS release, the Mario Kirby Meisaku Video (meisaku meaning masterpiece), had Mario and his fellow Nintendo icon Kirby go on separate adventures, in stories told via still imagery and narration accompanied by text that was intended to teach Japanese children kanji, Chinese characters which are commonly used in Japanese writing. Super Mario-Kun is the longest-running Mario manga to date, with over 50 volumes published since 1991. Mario's first manga series was published under the KC Deluxe banner in Kodansha's Comic BomBom magazine from 1988 to 1998, and was collected in 42 volumes. While volumes are named after and based on specific games, the manga also features original characters and scenarios. Super Mario-Kun (スーパーマリオくん Sūpā Mario-kun), a manga series written by Yukio Sawada and serialized by Shogakukan in its magazine CoroCoro Comic, contains retellings of many of the various stories in Mario games. The first entry in the series was published in 1991, and is the longest-running Mario manga series. Originally only available in Japan, the series was localized for France by Soleil Manga starting in late 2014, with a Spanish localization by Planeta Cómic following in 2016. Between 1992 and 1994, Shogakukan published a second Mario-themed manga: Otenba Peach-hime (roughly "Tomboy Princess Peach"), written and drawn by Sayuri Jo for the Shōgakusannensei magazine and aimed at younger readers. The series consisted of gag strips starring a younger Princess Peach alongside other Mario characters. Super Mario 4koma Manga Theater was a Yonkoma gag manga that began publication in 1993. The series was a collaborative effort featuring several artists, and focused on jokes based on scenarios or other features in various Mario games. 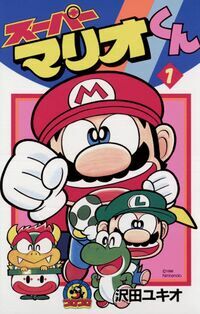 Starting in 2004, another manga titled Super Mario-Kun was published under the Pikkapika Comics label and was written and drawn by Hiroshi Takase. The series ran for only five volumes and was discontinued when the author died in 2006. A comic based on the original Donkey Kong arcade game was featured in the first issue of Marvel's short-lived video game magazine Blip, released in February 1983. The comic features reporter Vic Video interviewing Mario as he faces off against Donkey Kong. The Nintendo Comics System, a series of comic books published by Valiant Comics in 1990 and 1991, was part of a licensing deal with Nintendo to create comics featuring characters from its video games and the cartoons based on them. 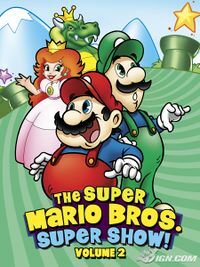 Valiant's Super Mario Bros. comic books were based on the three main Mario games on the NES and, to some extent, on the Super Show. They featured many long and short stories, which were comedy-oriented and included a number of exclusive original characters, the most prominent being a scatterbrained de jure ruler for the Mushroom Kingdom, and his adviser Wooster. The series also featured a number of fake advertisements and letter pages. Another Nintendo Comics System series, the four-issue miniseries Game Boy, had the characters of Super Mario Land appearing in the real world from Game Boys, with Mario trying to stop Tatanga from taking over the world. Mario characters and elements also featured prominently in the comics published in Club Nintendo, Nintendo's official magazine in Germany. The first of these comics appeared in the April 1991 issue, and thirty-six more Mario-based installments were released over a span of several years. Super Mario Adventures, a comic anthology written by Kentaro Takekuma and drawn by Charlie Nozawa, was published monthly for exactly one year by Nintendo Power from January to December 1992. Loosely based on Super Mario World, the comic follows Mario, Luigi, Yoshi, and Toad as they set off to save Princess Toadstool and the other Yoshis from the Koopalings and Bowser, who intends to forcibly marry the princess. Immediately following the end of Super Mario Adventures, Nintendo Power concluded the epic with a ten-page story based on Super Mario Land 2: 6 Golden Coins titled Mario vs. Wario, which was featured in the January 1993 issue. Shortly thereafter, Super Mario Adventures was reprinted in graphic novel format, with Mario vs. Wario as bonus content, and would later be reprinted a second time by Viz Media in 2016. Mario vs. Wario: The Birthday Bash, a second Mario vs. Wario comic, was published a year later, in the January 1994 issue. Archie Comics made a pitch to Nintendo for a new Mario comic years later, which was rejected. One of ten Nintendo Adventure Books based on the Nintendo Comics System stories about Mario. The Mario brand was licensed to Western Publishing for use in children's books in its "Golden Look-Look Book" line, which was aimed at very young readers. Three Super Mario Bros. books were published under this banner in 1989 and 1990, and were written by Jack C. Harris. The first, Trapped in the Perilous Pit, has Bowser kidnap Princess Toadstool while Mario and Luigi are trying to repair the castle pipes; the brothers try to push back the Koopa Troop as they advance, but unfortunately fall into a pit, with the princess thrown in as well. Happy Birthday, Princess Toadstool! centers around Mario and Luigi's contest to see who can be the first to claim a Starman to present the princess for her birthday. The third and last, The Secret Bridge, has the brothers and the princess create a bridge to avoid paying Bowser's toll. 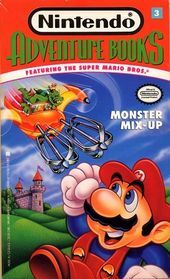 The Nintendo Adventure Books series was published between 1991 to 1992 by Archway Books in the United States, and Mammoth Books in the United Kingdom. They are formatted like the popular Choose Your Own Adventure books, where the reader makes decisions throughout the story that change the outcome of the plot. At the end of each book is a rating page, in which the reader would tally their score based on how they did in the book to determine their rating. Ten out of twelve books in the series are about the Mario Bros.' adventures in the Mushroom Kingdom and are based primarily on Valiant's Nintendo Comics System stories. Additionally, Scholastic Corporation published two Mario children's books of its own. The first, released in 2001, was a Choose Your Own Adventure-style guide book based on Super Mario Advance (the Game Boy Advance's remake of Super Mario Bros. 2), as part of a series of four Nintendo-based books in this style. 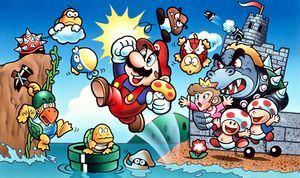 The second was Mario and the Incredible Rescue, a 2006 chapter book that takes many of its plot elements from Super Mario RPG, and was one of two books in Scholastic's short-lived Nintendo Heroes series. In 2015, a pair of books were published for the Super Mario Bros. 30th Anniversary celebration. The first of these, Super Mario Memorial Book, was released in September 2015 and features the history of the franchise, a list of characters, developer interviews, and more. The second is Encyclopedia Super Mario Bros., which features comprehensive details on characters, items, gameplay techniques, and more from every Super Mario game up to Super Mario 3D World. Mario has appeared on T-shirts, caps, sneakers, and various other clothing; accessories and school supplies; board games and trading cards; in candy form, on soda cans, cereal, Pez dispensers, and kitchenware; and on backpacks, badges, shampoo bottles, lunch boxes, and miscellaneous other items and collectibles. The Mario characters have also appeared as figurines, keychains, and plush toys. Licensed versions of popular board games have also been released, such as Donkey Kong Jenga, Super Mario Chess, and a special version of Monopoly based on Super Mario Bros., all of which were released by USAopoly. The Mario franchise's central theme tune is the overworld theme from Super Mario Bros., written by Koji Kondo. It has been featured in many concerts, including PLAY! Chicago, the Mario & Zelda Big Band Live, Play! : A Video Game Symphony, and the Video Games Live concert. Arrangements of this theme have been performed by the Columbus Symphony Orchestra, the Eminence Symphony Orchestra, the Swedish Radio Symphony Orchestra, and the Tokyo Kosei Wind Orchestra, among others. “Also, are you planning to make more Super Mario Bros. games? Artwork from an early 1990s Nintendo Power guide depicting various Mario games: Donkey Kong, Super Mario Bros. 3, Dr. Mario and Super Mario World. Throughout the Mario franchise's life span of over thirty years, many critics, fans, and developers have considered it to be the greatest video game franchise of all time. Mario is widely considered the most famous video game character in history and an icon of the gaming industry. Mario was an inaugural inductee of San Francisco's "Walk of Game," which honored notable figures in video gaming from 2005 to 2012; and was the first video game character to be honored with a figure in the Hollywood Wax Museum in 2003. At the height of his popularity, a national survey showed that Mario had become more recognizable to children than American cartoon characters like Mickey Mouse. Miyamoto has declared Mario to be his favorite out of all the characters he has created. Being the largest gaming franchise in existence, Mario has received many high-scoring reviews on its various games. All of the main series entries have very high approval ratings on GameRankings; for example, Super Mario Bros. holds an 85% score, Super Mario Bros. 3 has 97%, Super Mario World has 94%, Super Mario 64 has 96%, and the first and second Super Mario Galaxy games and Super Mario Odyssey all hold scores of 97% -- placing all three in the top five best-rated games on the site, with the first Super Mario Galaxy in the top spot. Many of the franchise's spin-off games hold high GameRankings scores as well, such as Super Mario Kart, which holds a 93% score. So far, no game in the franchise has ever had a rating below 50%. Mario is the best-selling video game franchise in history; since 1995, 31 of its games have received special marking labels from Nintendo for having sold over 1 million copies. The games in the core series, alone, have sold a combined total of over 310 million units worldwide; the Mario Kart series has sold more than 100 million units; the Mario Party games have sold more than 39 million units; the Donkey Kong arcade game sold more than 125,000 machines, while its Coleco version sold six million cartridges; and Mario Bros. sold 1.72 million Famicom cartridges in its Japanese release. Mario's legacy has also been recognized by the Guinness Book of World Records, which awarded the Nintendo mascot and the video games featuring him seven records in its 2008 "Gamer's Edition"; these include "Best Selling Video Game Series of All Time", "First Movie Based on an Existing Video Game", and "Most Prolific Video Game Character", as up to that point, Mario himself had appeared in 116 distinct titles (not counting remakes or re-releases of existing games). In the franchise, many games have been considered to be the best of their time by players. However, the franchise has been considered to have some games of lower quality. Examples include later installments in the Mario Party and Paper Mario series; after the releases of Mario Party 3 and Paper Mario: Sticker Star respectively, both series have been cited as losing their flair due to stagnation or increasing shallowness. Super Mario Bros. was declared to be the greatest video game of all time twice: once by GamesRadar in 2000, and another time by IGN in 2003. The Mario cartoons also were shown to have received favorable reviews. Though each of the series were short-lived, they were considered to be highly popular, attracting an audience of children to each episode. Even with the success of the games and cartoons in the franchise, some productions have attracted many negative reviews. The Super Mario Bros. film is often considered to be a great failure, and even Hoskins and Hopper were recorded expressing personal distaste for their work. In the May 2006 issue of Nintendo Power, an interviewer from the magazine had said, "Yes, it happened. Let us speak no more of it." Hotel Mario has often been cited as one of the worst video games ever. The Mario franchise has culturally impacted a multitude of people over the years, with references and parodies in numerous entertainment media. It has also been referenced in real life outside the media, where many people and places have been named or nicknamed in the character's honor; and a specific calendar date, March 10, is celebrated as "National Mario Day" because when presented as MAR 10, it resembles the name of Mario. The Mario franchise has been referenced more times in video games than in any other medium. Many of Mario's fellow Nintendo properties, including The Legend of Zelda, Star Fox, F-Zero, Pokémon, Kirby, and Animal Crossing, have referenced the company's flagship franchise in very notable ways. Even games and franchises not produced by Nintendo―such as Minecraft, Super Meat Boy, Call of Duty, Just Dance, Angry Birds, Banjo-Kazooie, and Overwatch―have made various references to the Mario games and characters. Mario characters and elements have been represented or parodied in numerous animated television series, including The Simpsons (in over a dozen episodes), The Ren and Stimpy Show, South Park, Family Guy, SpongeBob SquarePants, The Fairly OddParents, Mad (in 16 episodes), and Gravity Falls. Mario has also been referenced in such live-action shows as The Fresh Prince of Bel-Air, My Name is Earl, The Big Bang Theory, and Tosh.0. Additionally, to promote the 2020 Summer Olympics in Tokyo, Mario appeared in a pre-recorded video shown during the telecast of the 2016 Summer Olympics closing ceremony, and Japanese Prime Minister Shinzō Abe arrived at the ceremony itself in a Mario costume and an oversized Warp Pipe. In film, the Mario franchise has been referenced in such titles as Billy Madison, Ghostbusters II, and Need for Speed. Notable appearances of Mario in film include 1989's The Wizard, which prominently features Super Mario Bros. 3 in the "Video Armageddon" tournament in the climax (marking the North American public's first exposure to that game), and the 2012 Rich Moore-directed film Wreck-It Ralph, where Bowser and the Super Mushroom make cameo appearances and Mario is name-dropped. The Mario franchise has also had minor representations in advertising (notably, in a Got Milk? commercial), and spawned several stage theatrical productions. Many books have also referenced the Mario franchise, including the Scott Pilgrim graphic novel series. The comics industry has also referenced the games in Western comic books, comic strips, and manga alike. Some publications have even been completely centered around Mario, such as several installments of the comic strip FoxTrot. A number of musicians have referenced Mario in their music, such as Eminem, Ludacris, and Trace Adkins. Some songs have been dedicated to the popular series, such as the song "Birdo" by Horse the Band, which is loosely based off the same-named Super Mario Bros. 2 boss. Additionally, the Mario franchise possesses a highly diverse fanbase, where content and gameplay are frequently shared via the Internet. As Nintendo's most popular series, Mario attracts fans of all ages and skill levels―one of its core mission statements. Many websites and online games have poked fun at the series, and there are several sites that have dedicated themselves to it completely. Thousands of unlicensed fan-made games, videos, comics, stories, cosplay costumes, artworks, and other materials dedicated to the Mario franchise and its games and characters have existed on sites such as Newgrounds, YouTube, FanFiction.net, and DeviantArt, among others; many of these fan-works have been viewed or accessed by tens or even hundreds of thousands of people. A few Internet memes have been based around Mario characters, and a multitude of YouTube videos have poked fun at one of the series' greatest blunders, Hotel Mario. Crossover titles such as Super Smash Bros. are highly coveted among fans, and frequently raise heated discussion in online communities; many of these titles help to introduce Mario fans to other Nintendo or third-party franchises, resulting in large amounts of fandom overlap. ↑ Nintendo Power, June 1994. ↑ Ingraham, Nathan. "Super Mario Run Is Just As Much Fun As We'd Hoped". Engadet. December 8, 2016. ↑ 9.0 9.1 Passary, Anu. "Mario Kart 8 revs up to 1.2 million units in sales, becomes fastest-selling Wii U game." TechTimes, June 4, 2014. ↑ 10.0 10.1 10.2 10.3 10.4 "Mario Kart Franchise Retrospective". WatchMojo.com. February 5, 2012. ↑ Gaijillionaire (May 30, 2017). A Lost Super Mario Anime Has Been Found and Shown Off in Japan. Nintendo Life. Retrieved May 30, 2017. ↑ Lamoreux, Ben. (November 2, 2015) Archie Comics Pitched a Super Mario Comic, But Nintendo Rejected It. Gamenesia. Retrieved April 15, 2016. ↑ rawmeatcowboy. (November 2, 2015). Archie pitched Nintendo a Super Mario comic, but it was shot down. Go Nintendo. Retrieved April 15, 2016. ↑ "MONOPOLY®: Super Mario Bros.™ Collector's Edition" page at USAopoly. ↑ "Super Mario Bros. and Zelda composer Koji Kondo to attend PLAY! Chicago". Music 4 Games. 2006-04-14. Archived from the original on 2009-02-25. ↑ "I hear a video game symphony". Pop Journalism. September 27, 2006. Archived from the original on December 15, 2007. ↑ "Super Mario Bros. Composer Koji Kondo Interview". 1UP.com. 2007-10-19. ↑ "Symphony piles up points with video game concert". The Columbus Dispatch. April 27, 2007. ↑ Dimix86 (September 7, 2007). Super Mario Bros. Medley (Eminence Symphony Orchestra) Youtube. Retrieved August 21, 2016. ↑ KRB (February 13, 2016). Super Mario - Suite (Live with the Swedish Radio Symphony Orchestra : SCORE Orchestral Game Music) Youtube. Retrieved February 8, 2017. ↑ "Nintendo's Shining Star: The History of Mario". Game Cubicle. August 23, 2008. ↑ Orlando, Greg. "Console Portraits: A 40-Year Pictorial History of Gaming." Wired News. May 15, 2007. ↑ Buchanan, Levi. "Is There a Bad Mario Game?" IGN. February 13, 2009. ↑ Iwabuchi, Koichi. Recentering Globalization: Popular Culture and Japanese Nationalism. Duke University Press. p. 30. ↑ "Exclusive Interview with Nintendo Gaming Mastermind Shigeru Miyamoto" on GamePress. ↑ Super Mario Maker has sold 1 Million units around the world. Nintendo, September 30, 2015. ↑ Bring along your amiibo as your party plus-one from 20th March in Mario Party 10 Nintendo. February 19, 2015. ↑ Ashcraft, Brian; Snow, Jean. Arcade Mania: The Turbo-charged World of Japan's Game Centers. Tokyo, Kodansha International, 2008. ISBN 4-7700-3078-9. ↑ Kent, Steven. The Ultimate History of Video Games: The Story behind the Craze that Touched Our Lives and Changed the World. Prima Games, 2001. ↑ Sheff, David. Game Over, Press Start to Continue: The Maturing of Mario. GamePress. ↑ Review of The Super Mario Bros. Super Show! ↑ Dievendorf, Schuyler. "8 Best Ways to Celebrate National Mario Day." The Escapist. March 10, 2014. ↑ Warner, Dani. "Jump-Start Your Week with Some Items of Interest". Star Tribune. March 7, 2016. This page was last edited on April 10, 2019, at 22:53.